Motorists are wasting almost £500,000 a year with simple MOT fails that workshops could help them avoid and encourage repeat business. Research carried out by WhatCar.com has shown that drivers are wasting upwards of £483,000 each year by failing to carry out basic checks ahead of the vehicles test. 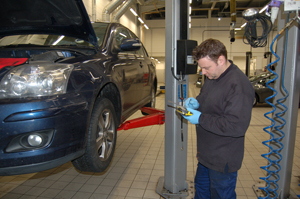 It shows that nearly four percent out of the 285,236 MOT failures recorded between August 2012 and 2013 by VOSA could have been easily avoided. This presents an opportunity for workshops to boost their profits and build a strong rapport with the customer by advising and solving these simple failures ahead of time. What Car highlights that the most common failures are down to low tyre treads and thickness on brake pads. It also says that 4649 cars failed due to the screenwash not being topped up, while 2852 needed a retest simply because the car was dirty or cluttered. Emma Butcher, Consumer Editor on What Car, said: “There are some really simple things that every motorist can do to help a three-year-old car pass its first MOT test, but its amazing how many people don’t do them.